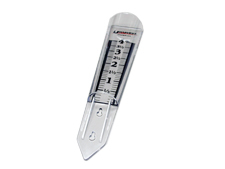 UHarvest Magnifying Rain Gauge - ACCESSORIES - Unverferth Mfg. Magnifying Rain Gauge with UHarvest logo makes it easy to read rainfall totals up to 4”. Measuring 12 1/2” tall, these rain gauges are designed so the water magnifies the numbers by more than 35%. They can be inserted into the ground or mounted on a post, deck or fence.